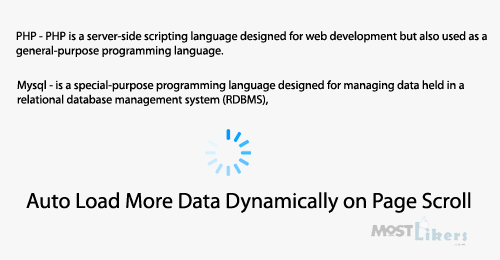 Load More Data Dynamically on Page Scroll. Generally, we use pagination for fetch large database records. But it's boring for website visitors. So my suggestion to use page scroll load more data jquery concept. Most of the website following like facebook, twitter this kind of code. Create a table 'content_information' or run below SQL query in your PHPMyAdmin. Create index page write the mysqli query for fetch total record count in the table. Have a Question? Share your feedback below. "Excellence is a continuous process and not an accident. " jquery is not loading the content. It show only 5 results. Hi, I sometimes see the last items in the list displayed twice when I get to the end of the list. Have you seen this happen? No it's working fine only. sir auto load was not working in mobile. please share the code for mobile.